Achilles Tendon Sprain or Strain? The Achilles tendon does not have a rich blood supply. Blood supply is weakest at a point between 2 and 6 cm above its insertion into the calcaneus (heel bone). Ignoring pain in the Achilles tendon (ie. "running through the pain") is the biggest cause of chronic Achilles tendonitis. For cyclists, initial Achilles tendon stress is often caused by having a low saddle height. This low saddle height can result in excessive dorsiflexion of the foot, which stresses the Achilles tendon. The Achilles tendon is the connection between the heel and the most powerful muscle group in the body. Tennis and soccer players over 40 are the most frequent sufferers of tennis leg (calf muscle strain). Sudden increases in running and or active sprinting sports can cause Achilles tendonitis. Excessive running up and down hills can aggravate the Achilles tendon. Stiff shoe soles at the ball of the foot will increase Achilles tendon strain. Excessive heel shock absorption can overstretch the Achilles tendon. Tight hamstrings and/or tight calf muscles create excess strain on the Achilles tendon. For triatheletes, the most common cause of injuries to the Achilles tendon is overpronation, inflexibility, or lack of strength. Immobility, due to an Achilles injury, may result in a contracted Achilles tendon and an increased amount of scar tissue. Hoffa's pad (also known as the infrapatellar fat pad) is a fatty pad that sits below the knee cap (patella) directly behind the patellar tendon. It functions to cushion the patella from hitting against the condyle of the femur (or end of the thigh bone) in the case of a direct blow to the front of the knee. Hoffa's Syndrome is a condition in which the infrapatellar fat pad either suffers a contusion or an injury, resulting in damage and swelling. This can lead to the Hoffa's pad becoming trapped between the femur and the patella every time the leg is extended. 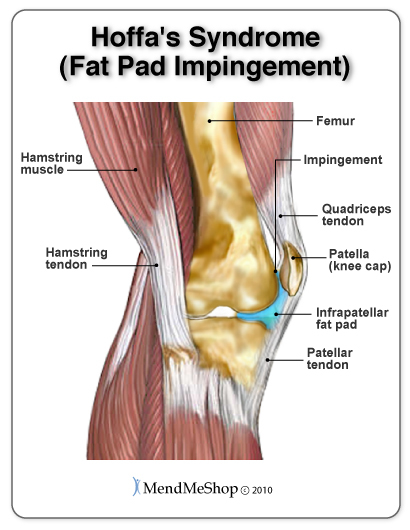 Fat pad impingement can also occur if the fat pad is pinched when the leg turns inward abnormally while running. The risk of this happening increases if you have instability in your knees or hips which can be a result of other conditions such as Achilles injuries. When favouring a sore Achilles tendon in one foot, you begin to use improper mechanics to walk or run and this can lead to unbalanced loads and over straining one of your knees and/or hips. The fat pad in the knee has a lot of nerve cells, so any injury to it is extremely painful. Because straightening the leg will cause the fat pad to become trapped it is being re-injured constantly and can lead to a significant recovery time if not treated quickly and correctly. Pain, inflammation, and swelling at the front of the knee cap and along the sides of the patellar tendon. Increased pain when the knee is extended. Standing for long periods on hyperextended knees will increase the pain. Squatting or using stairs will often make the pain worse. Participating in activities or sports where a blow to the knee is possible such as football, rugby, soccer, and hockey. Participating in activities or sports where hyperextension of the knee is possible such as football, rugby, soccer, and volleyball. If you have suffered an anterior cruciate ligament (ACL) injury the stability of your knee decreases, leaving the infrapatellar fat pad more prone to being pinched. Runners with excessive pronation (also known as flat feet) or weak hips may experience quick leg turns inward while the knee cap (patella) remains behind, causing the fat pad to be pinched. Hyperextension of the knee, via anterior pelvic tilt. Body biomechanics are altered when wearing high heeled shoes, and a common result is knee hyperextension and a shortening of the quadriceps muscle group. People who has Iliotibial (IT) Band Syndrome. Your doctor or health care professional will examine your knee to determine if you have Hoffa's Syndrome (fat pad impingement). Typically, he/she will ask you to lie down with a bent knee. You then slowly straighten your leg while the doctor presses his or her fingers below the knee cap (patella), on either side of the patellar tendon. Any pain or hesitation when straightening the leg is considered a positive test for Hoffa's Syndrome. Allowing your knee to rest is always recommended when you are suffering from fat pad impingement. 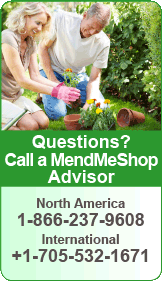 Avoid activities that may have caused the injury or irritation. This means stop the sports or if you wear heels, you should stop this as well. It is difficult to rest your knee completely as you have to get on with your daily activities but it is important to do so to stop what is or may become a vicious cycle, as swelling and inflammation will worsen the impingement. Inflammation is the body's natural response to an immediate achilles injury and is a normal part of the healing process - helping to reduce tissue infection in the early stages of injury. Swelling, pain, heat sensation, redness, and loss of function are the main symptoms experienced. 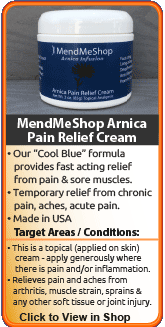 The combination of rest, topical pain relief cream and minor amounts of cold therapy is the gold standard in medicine for minimizing tissue damage and reducing inflammation after injury or activity. It serves as a critical bridge into the next phase of the healing process. 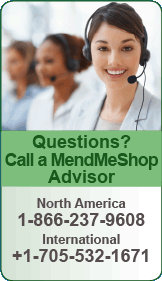 Your physical therapist may prescribe ultrasound and/or tens therapy sessions. Further to this, taping the knee is a common, easy protocol that is used for treatment of Hoffa's Syndrome. The aim of taping is to offload stress on the fad pat and prevent impingement, while also helping constrain knee extension. More importantly, the physical therapist will most likely assess your specific biomechanics and attempt to correct them if they are determined to be causal factors to your condition. Stretching and strengthening exercises, centered on the quadriceps and hamstrings will probably be provided to you as well. 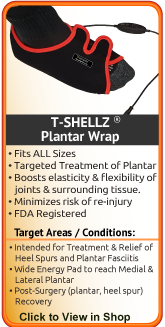 After the inflammation and swelling below your kneecap and around your patellar tendon is gone, you can begin to treat your entire knee with Deep Tissue Regeneration Therapy via use of the T•Shellz Wrap®. DTR Therapy increases the amount of blood that flows naturally to your knee that will nourish muscles, tendons & ligaments to boost the body's natural healing process. During your recovery, you will probably have to modify and/or eliminate any activities that cause pain or discomfort in your knee until your pain and inflammation settle. Taking the time to care for your knee properly will have your knee back to normal faster and allow you to get back to the activities you enjoy. On-going DTR Therapy treatments at home, every day, will soothe, relax and promote healing of damaged soft tissue. DTR Therapy treatments on the knee will allow soft tissue to extend further when you do some stretching after the treatment. In a nutshell, consistent DTR Therapy treatments combined with light stretching will elongate quadricep and patellar tendons & increase their elasticity; this will aid in reducing impingement on the fat pad while reducing the risk of reinjury. Basically, it will reduce the risk of a vicious cycle of a continually worsening fat pad injury. 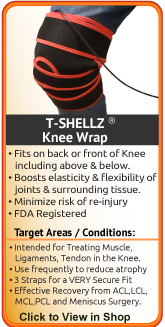 By treating yourself at home with the Knee T•Shellz Wrap® you can increase your body's blood supply to the knee and your body's natural healing power. In addition, the fresh blood flow whisks away dead cells and toxins that have built up from swelling and inflammation which can significantly hinder the body's ability to heal itself. 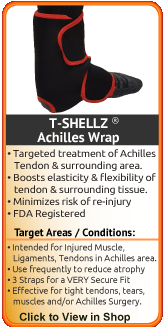 Our Knee TShellz Wrap provides effective, non-invasive, non-addictive pain relief and blood circulation stimulation via deep heat. With dedication, the right tools, and the right information - you will achieve your goal of a sustainable recovery. A combination approach of cold therapy, deep heat treatments, and functional movements will make it happen much more quickly. Healing takes a comprehensive approach and will differ from person to person. 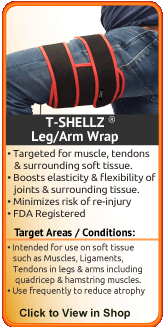 The best home treatment option we came across in our research to accomplish faster healing of soft tissue injuries in the knee is the Knee T•Shellz Wrap®. Use of this device results in a significant increase in blood flow to the injured tissues located deeper within the body - all in a non-invasive manner. 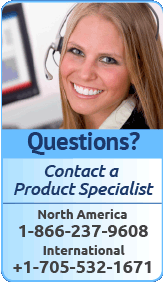 If you have questions, we welcome you to call our office toll-free at 1-866-237-9608 (Continental US), or Internationally at +1-705-532-1671. Remember: We recommend that you consult your doctor and/or physiotherapist before using any of our outstanding products, to make sure they're right for you and your condition. - but not all of it is factual. We spend hours per week doing the research... separating fact from fiction. We then present this information in an easy-to-read newsletter, generally sent once per month. There are over 250,000 achilles tendon injuries each year in the US. Achilles tendon ruptures are common in people between the ages of 30 and 50. In runners, too rapid an increase in mileage, hill training without proper strengthening, and recent or inadequate changes to running gear can cause injuries to the Achilles tendon. Achilles tendonitis accounts for an estimated 11% of running injuries. 3-5% of athletes are forced to leave their sports career due to Achilles tendon overuse injuries that go untreated. Medications mask the pain but do very little in the healing of Achilles tendonitis. Anti-inflammatories, cortisone injections, and pain killers can cause Achilles tendonitis to worsen. A fully ruptured tendon REQUIRES surgery. It will not heal on its own. Achilles tendonitis and Achilles tendinitis are the same thing. Continually using your Achilles tendon while it is injured will lead to a more serious and/or chronic injury.